Mother Nature was almost the spoiler coming into this weekend's inaugural event called the Highland Claymore Challenge at our home mountain, Highland Mountain Bike Park. Torrential rains, high winds and even tornadoes touched down 10 miles from the course coming into the weekend so there were questions if the event was even going to happen. Course designer Dave Smutok and crew did their homework though and in true HMBP fashion, pulled it all off to the delight of hundreds of spectators gathered to watch the contest. 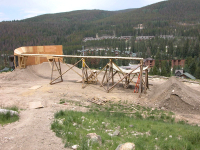 The Red Bull title sponsored course ,was an absolute marvel in trail and stunt building. Huge stepdowns, hips, massive doubles, a wooden quarter, 18 foot high wallrides and even a "house" feature that riders could gap out onto and trick off of made it so there was something for everyone. Another rad part of the event is that it was one of two slopestyle contests in North America that had a spot for the top non-international competitor to qualify for a chance to compete Darren Berrecloth's contest, "The Bearclaw Invitational, in Washington, BC. 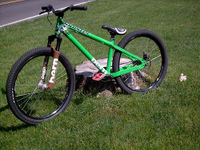 Sinister Bikes was well represented with 3 of the four factory rippers slated to compete. Sasha Yakovleff wasn't able to compete due to an injury but still came out to rip up the course and check it out. He was the only rider hitting a cool transfer on Friday in true "Yak Attack" style. Here's Yak flowing. Knight Ide was the first Sinister rider to compete in Saturday mornings Am class and he absolutely killed it out there, riding smooth and stylish against kids younger than his own son. He just wanted to ride the course, have fun and represent his sponsors, which he did with class. Derek Stevens came into the event without the amount of practice that everyone else had as he had been working like a madman. In practice and qualifying though, you would have never been able to tell as he was boosting, flipping and whipping like a freakin' madman in only the way D-Rock can. He was riding well and slaying the course when a spin from way up in the air went bad. He crashed to the ground from so far up and he wasn't getting up. He dislocated his knee and got taken out on a stretcher but still managed to come back later in the day to support his teammate and watch the finals go down, like a true warrior! The final Sinister rider in the event was the one and only Dane Berke and he did not disappoint.Dane is a Highland regular who always is ready to throw down his "big mountain with an urban twist" style and in doing so, made the finals! He beat out legends like George Ryan and Carter Holland with his trademark Suicides and Supermans and Amplitude that was killer to watch. To see Dane's name on that finals list could've brought a tear to all of us in the Sinister Family. He blazed his two runs in the finals much to the delight of the crowd! Cam Macaul came out on top in the finals and Cape Cod local and former Sinister ripper Clinton Macmahon won the trip out to BC with a resounding fifth place after qualifying in first place! The whole mountain just went off and owner Mark Hayes was estactic with the overall success of the event. Some serious partying and celebrating was in order and Northfield NH stayed up late! Mark Hayes crowning winner Cam Macaul. Keep your eyes out for video and more photos from the event in the upcoming Mocean365 Tv show which is a collaboration of Veilleux Films, and PerpetualMocean. More pictures will be posted up on the PerpetualMocean SmugMug soon, so check back! Thanks to everyone who made this a great event and can't wait for next year! 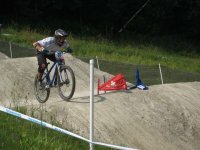 Results and pictures are funneling in from the 2008 Nationals at Mount Snow. For a complete list of results CLICK HERE. Matt (GrnBkr), for a great finish on his Mustang. Matt is having a great season and on top of this finish this weekend (11/30 in Expert Men 19-24) here is a list of his accomplishments including 3 Podiums!!! 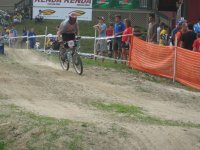 Also with a great finish in the Downhill Expert Men 25-29 class was Dave Custer. Custer's time of 5:45.48 puts him as one of the fastest times of the day. Enjoy some pictures from The Kid and we'll update this post with more results (Max and the rest of the crew) later on. Congrats to all of you guys!! When we started talking about a new site about a year ago, we all knew it had to be something we could be proud of. 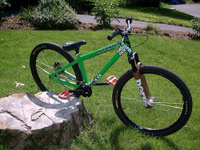 Not just a modified template, but something worthy of the Sinister name that would profile the talent of our Team Riders and showcase our bikes. The search for someone to do this work was extensive and ended on a recommendation from a close friend Mark Anastas at the Liquid Dreams Surf Shop in ME. He always talked so highly of his “web guy” so we set up a meeting. From the first time we met Michael DeSouza and Justin Velgos at cgCraft llc. we knew it was going to be great. We came with some ideas and it was uncanny how they were thinking the same thing. Michael and Justin ran with it and we were blown away by the initial designs they sent us. Everyone knew this was going to be something great and we can’t thank Michael and Justin enough for the incredible amount of work that went into the site with a truly amazing outcome. It goes without saying that the content of the site would not have been possible without Bruce, Frank or Skye. Bruce continues to keep Sinister rolling everyday by doing everything in his power to answer questions, getting the bikes out and helping to secure the future of Sinister Bikes. 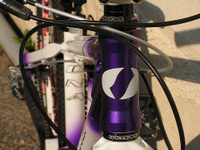 FTW for creating the brand and bike that we can now showcase as the works of art they really are. 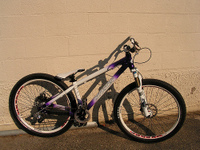 Also for all the bike descriptions…and yes Bruce Gordon did give FTW some big 700C tires more than ten years ago. Skye for all of the incredible photography on the site. Skye is the first to say that the Team Riders, Sasha, Derek, Knight and Dane are the ones that should be thanked, but Skye’s ability to capture the talent of these amazing athletes is something that takes years to accomplish. And of course, the veteran Team Riders, Sasha Yakovleff, Knight Ide, Derek Stevens and Dane Berke. The commitment that these four riders have given over the years and the need for it to be recognized is the reason why we began this work in the first place. Finally, to the Sinister Family of riders, supporters, satellite teams and bike shops. We appreciate your continued support and hope you enjoy what we have in store for you. So, PLEASE continue to support your local bike shops and Authorized Sinister Dealers. If you are not sure who that is in your area, give us a call and we will let you know. Sinister has always offered direct sales, but encourage everyone to talk to your local shop, get to know them and have them help you get on a Sinister Bike. You won’t be disappointed.